"I'll warrant that Aaron's rod bore no bonnier blossoms than these little stiff bushes—and none more magical. For every time I take up a handful of them they transport me to the Highlands, and send me tramping over the braes and down the burns. "—Van Dyke. WHAT potent charm have the gods bequeathed this mountain blossom, that the heart of a Scotsman, be his home amid the Lowland peacefulness of his native land or on its stormy Highland hills, clings to this moorland flower with a pathos of tender, reverent emotion which the foreign world gazes upon in pleased wonder and cannot interpret? Is it only that the ragged spray of deep greenery and purple bells calls forth, to the exiled Scotsman, those sacred memories of early home ties the fond dinging love for which forms so strangely a refining element in the sturdy, harshly sterling Caledonian nature? Is it that within his heart the bonnie native bloom brightens anew, like a soft moonlight glow creeping over some lonely barren midnight solitude, the deserted waste of these fading recollections—lures from out the lurking shadows of his loneliness those cherished scenes and friendships and severed ties of "auld lang syne"—and brings back, like quivering echo-strains from a far-away distance, the music of those sweet hame-fireside hours that will "never come again?" Or is it a power more mystic than this artless sympathy of brotherhood, which is the universal heritage of the human heart? Is it, rather, some spell of deep human feeling that, like a wailing ghost, haunts those bleak Scottish hills—the historic plaintiveness of Covenanter flight and persecution that wraps their crags in fascinating gloom and still leaves upon them spirit-prints of martyr bloodshed? Is it those unforgotten scenes of fraternal strife when the restless clansmen of early Caledonia, with the seething vigor of their untutored mountain life in their veins, stormy fire in their eyes and in their hearts stormy hatred, hunted each other through those Highland glens and over their rocky peaks, while the slogan rudely woke the low nature-music of the Highland calm and thrilled the succeeding silence with voiceless portents of evil fate? And is it that, to the sympathetic soul, come the dream-voices of those restless stem departed, who from out the shadows of the beyond lonesomely wander back to their loved Highland home, bringing again that grim ghostly message to the shrinking Hamlet, "I could a tale unfold?" Is it the patron spirit of poetic genius which has immortalized their rugged solitude—the atmosphere of romance and wild story that so entrancingly wanders amidst it? Or is it, perchance, the spiritual interflowing of all these crude human and poetic emotions, drifting throughout the quiet nature-enchantment like a fleecy scattering, eternally unfading silver mist? Hogg tells us that when Lieut. Patrick Campbell took a voyage to North America with the view of ascertaining upon the spot what was the actual situation of those who had emigrated to that quarter, upon taking leave of a woman whom he had known in the Highlands, he asked her what he could do to oblige her. "Nothing," she said, that she could at present think of, unless he could send her a few stalks of Heather, which she longed exceedingly for; it would do her heart so much good to see it once more. There was a bit of poor ground behind her house where she had always thought the Heather would grow if properly taken care of. Not long ago a Scottish gardener died at Inwoodon-the-Hudson, N. Y. Around the bier were scattered many beautiful floral designs, made of the choicest of conservatory blossoms. A brother gardener, also a Scot, who attended the funeral, took with him a little spray of Heather which, by permission of the widow, he pinned on the lapel of the dead man's coat. The mourners, mostly Scotch folk, immediately forgot the costly flowers, and the tears that welled up in the eyes of the onlookers echoed more eloquently than spoken words the remark of a leaf-hearted Scottish gardener's wife who stood on the opposite side of the casket: "That's just what he would have liked!" Sorrow for the dead was temporarily assuaged by the magic power of that token of fraternal and native friendship, "a wee sprig o' Highland Heather." At one of the annual suppers of the St. Andrew's Society, held in Delmonico's, New York, and presided over by the eminent Scotsman, Dr. Andrew Carnegie, the favors were orchids (Cattleyas). A member of the Society, Dr. A. M. Stewart, editor of the Scottish American, of Manhattan, had brought with him to the banquet a plentiful supply of Heather, for boutonnières for those present. At sight of the enchanting little blossom, fingers began to itch, and elbows to crook, one hand reaching out for a sprig of blossoming Heather, the other gradually nearing the costly "button-hole," and the request to "throw away that weed," required no repetition, for as by magic there was a general dethronement of the "aristocrat of the vegetable kingdom," and the blossom that aye shall stand to every Scot as king of flowers supreme, adorned the manly breasts of the manly men to whom auld Scotland is ever dear, who never turn a deaf ear to the cry for help that stern misfortune wrings from Scotia's sons in the land of their adoption. 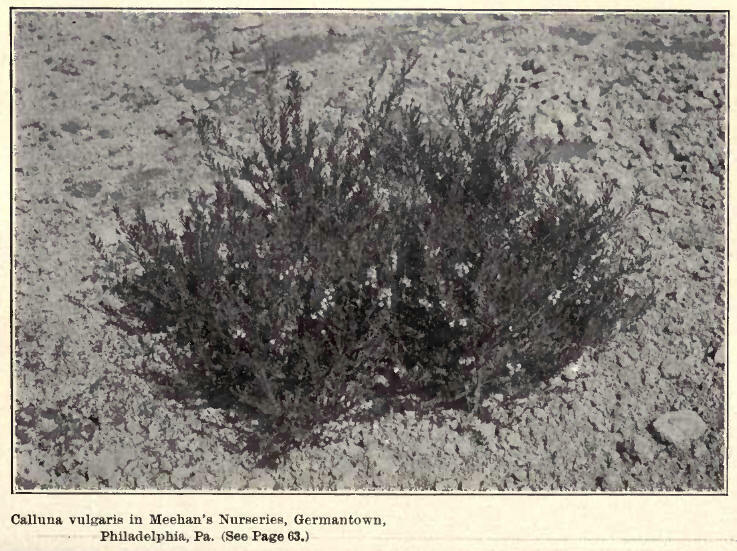 To satisfy the longing of the Scot abroad for a plant of his familiar and beloved Heather, a firm in Edinburgh, Scotland, has taken a great interest in the exportation of Heather roots to far-off countries. Consignments have been sent to Canada and to Australia, packed in Wardian cases. 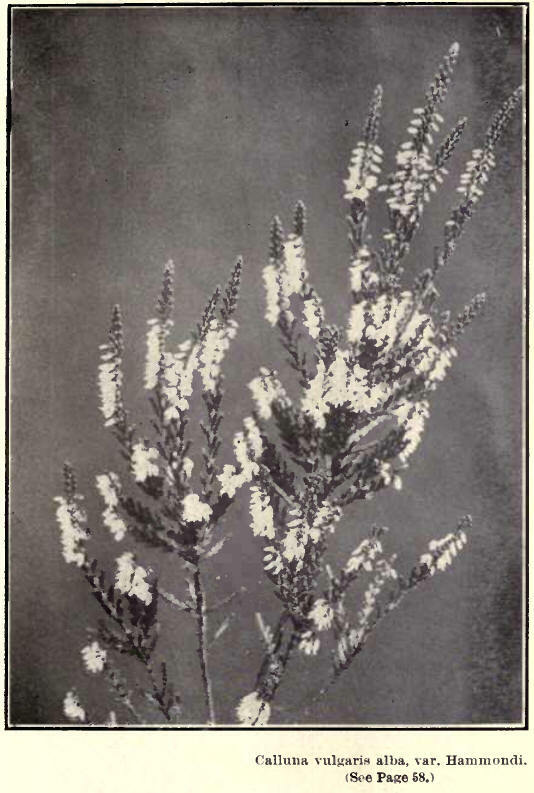 In each case is a plant of White Heather, symbol of "good luck." Ah, how true it is that "Memory is a capricious and arbitrary creature. You can never tell what pebble she will pick up from the shore of life to keep among her treasures, or what inconspicuous flower of the field she will preserve as the symbol of 'Thoughts that often lie too deep for tears.'" For cauld is the pleasure at best she can gie. A wee sprig o' heather sac withered and sma'. The land where the bluebell and thistle are seen. A sprig o' his ain native heather sac sma'. Awa' frae its hame in the mountain sac hie. He langs for a tuft o' heather sac sma'. —john MacFarlane, in "Heather and Harebell." What message bring ye me? 'Mang heather on the brae. 0' love that ne'er will dee. Frae oot the grassy howes. I'll keep thee a' my days. James Broomfield, in "Murmurings from Rugged Waters." —William Anderson, in "The Scottish American." Noo that I ken I'm nae forgot! When first I saw yer wee bit heather. An' lichtly touched me as it passed. An' idly pu' a wee bit heather. An' noo an' then a patch o' green. And on her breast the wee bit heather. Tho' trackless ocean lies between. I fan', to see yer wee bit heather. And happy lovin' thochts o' you. Has got my heart, an' been sae true. I'll cherish aye, yer wee bit heather. An' every wish is yours, for life. To trig it xvi' yer wee bit heather. Whene'er I see yer wee bit heather. —Louise F. McDonald, in "The Scotsman," Edinburgh, 1881. The hearts of Scotsmen thrill. —From "Bramble Brae," by Robert Bridges.—Copyright, 1902, Charles Scribner's Sons.